Stopping the study "without warning or adequate reason is beyond heartless"
Outrage has followed the Trump administration’s decision late last week to put the brakes on a study into the health impacts of mountaintop removal coal mining in Central Appalachia. Also denouncing the development is Rep. Raul M. Grijalva (D-Ariz.), the ranking member of the House Committee on Natural Resources, who said the move was another sign of the administration’s war on science and interest in doing the industry’s bidding. “Every time some reckless industry hurts working people, this administration is there to provide political cover,” Grijalva said Monday. 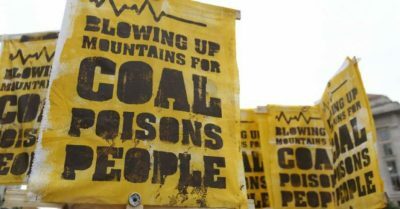 “Mountaintop removal mining has been shown to cause lung cancer, heart disease, and other medical problems. Clearly this administration and the Republican Party are trying to stop the National Academy of Sciences from uncovering exactly how harmful this practice is. Stopping this study is a ploy to stop science in its tracks and keep the public in the dark about health risks as a favor to the mining industry, pure and simple,” Grijalva said.